Since I'm graduating this coming weekend I've been doing a lot of reflecting on my time in college. In the past five years I've learned so many things that are sure to help me for years to come, which was the whole point of this experience. 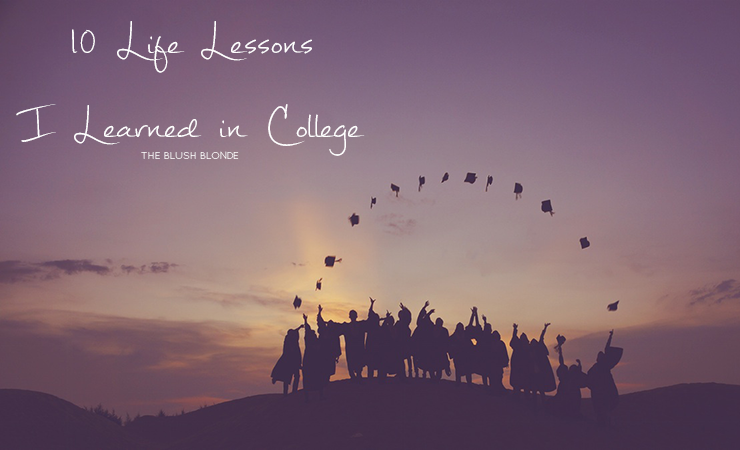 However not all of my knowledge was learned in class and below I have for you what I think are the ten most important life lessons that I'm taking away from my college experience. 1. What you learn outside the classroom can be just as important as what you learn in the classroom. 2. College (and life) is not always going to be easy, but you will get through it. 3. Everything will get done. College (and life for that matter) can be super overwhelming, but everything eventually does get done on time. 4. Surround yourself with positive people because being around people who are negative will bring you down. 5. It's ok to ask for help. This was a hard one for me, but asking for help is a must in some situations. 6. Getting out of your comfort zone can have amazing results. My sophomore year I had to move in with three strangers after a bad roommate situation and now one of those girls is still one of my closest friends four years later. 7. Always stand up for yourself. It is important to stand up for yourself because from now on you are your own advocate. It may be difficult, but it is sometimes necessary to stand up to friends, professors, roommates, etc. and you will be happy that you did. 8. Everyone has anxiety about something, you're not alone. 9. Sleep is very important. I've learned that skipping out on sleep just doesn't work for me, I'm a much happier and more productive person when I'm rested. 10. Make sure to have fun! What are your favorite life lessons you've learned over the years? I have learn the hard way that it is okay to ask for help. A lot of times I let insecurities prevent me from asking for help but now I know it is a weakness to ask for assistance.